Philips, a global leader in lighting, consumer lifestyle and healthcare, launches the Philips Urban Adventure to challenge thrill-seekers and race enthusiasts. The competition is a one-day race around Metro Manila, where 12 two-person teams will take on various physical and mental challenges, and get a chance to win P100,000 in cash and prizes. The challenge is set for August 27, 2011 as part of Philips’ 55th anniversary celebrations in the Philippines. “The Philips Urban Adventure is definitely one of the activities we are most excited about as we celebrate our 55th anniversary. It is sure to be a fun and challenging competition, and we hope to gather the best competitors, as well as present the many remarkable facets of Philips through this special activity,” remarked Rico Gonzales, CEO of Philips Electronics and Lighting, Inc. The race was formally unveiled in a press conference hosted by fitness celebrity Rovilson Fernandez, who also joined the Amazing Race adventure in the past. 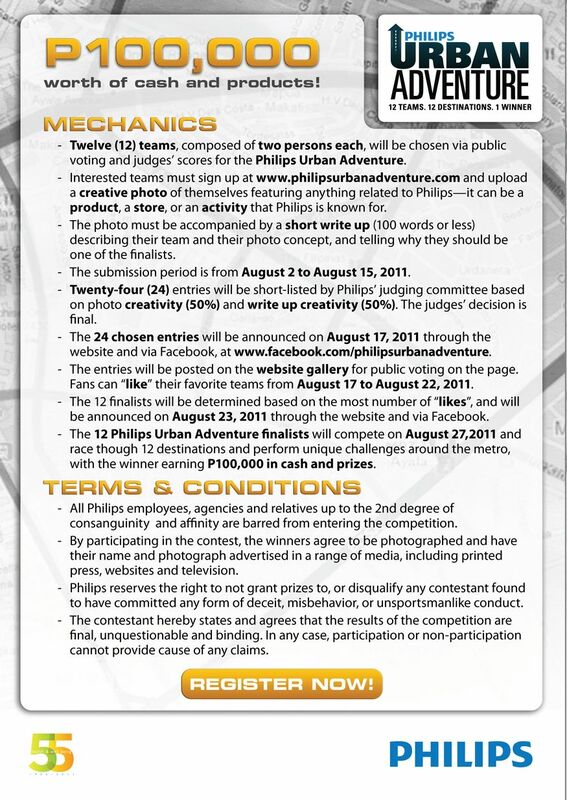 “The Philips Urban Adventure is definitely a must-see and must-join competition, and speaking from experience, I can guarantee that the contestants will have the time of their lives,” Fernandez said. Registration for the race is now ongoing, and interested teams may sign up at the official Philips Urban Adventure website where they will be asked to upload a creative photo of themselves featuring anything related to Philips, such as a product, a store, or an activity that Philips is known for. The photo must be accompanied by a short creative write-up describing the team and the photo concept, as well as explaining why they should be among the finalists. From the initial pool of entries, 24 teams will be shortlisted by Philips’ judging committee based on photo creativity (50%) and write-up creativity (50%). The 12 finalists will then be decided via public voting on the website. The application period will run from August 2 to 15. 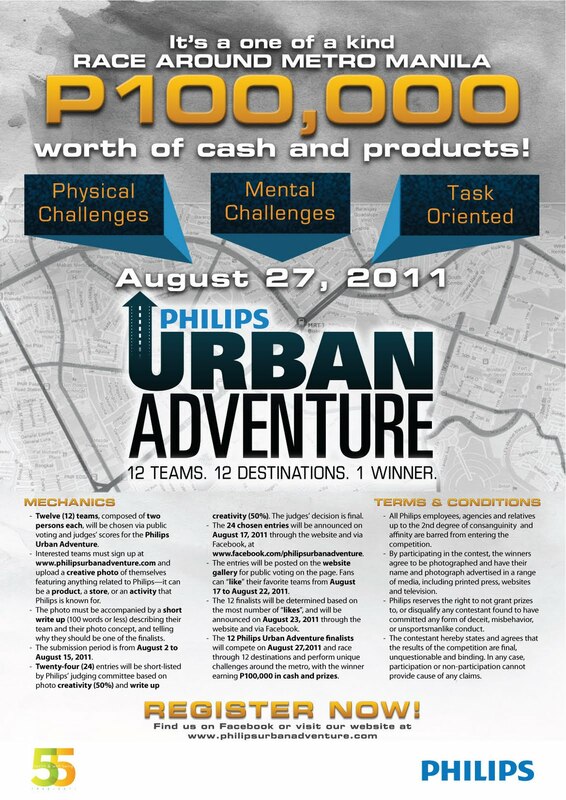 The 24 shortlisted teams will be announced on August 17 via the Philips Urban Adventure on Facebook. Fans can vote for their favorite teams from August 17 to 22, with the 12 finalists set to be announced on August 23. Regular updates on the event will be posted on the Facebook page.